You will earn 4,342 Reward Points. Earn 1 reward point for every 1 dollar spent. Each heated dispenser features its own thermostatic control. Heating System: Unit shall be 120 VAC 60 Hz and shall have 6’ (1829 mm) power supply cord with 5-15P (5-20P on Models 8409 and 8410) NEMA plug for 120 VAC. Mobile frame shall have electrical junction box mounted under bottom shelf, with hard wired power cable to each dispenser. 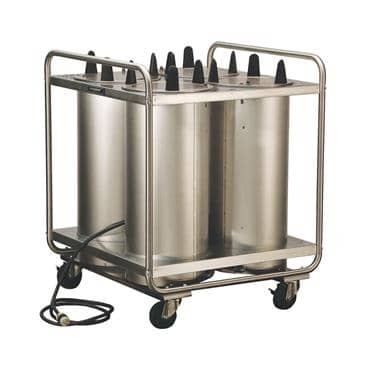 Dispenser tubes shall have a circular bottom mounted 300 or 450 watt heater element to provide convection heat. Heating system shall feature thermostatic control in a tamper protective location with safe high-end shut off. Control shall have Infinite settings between low and high temperature cut-outs. Thermostat shall be field adjustable for average interior air temperature between 100°F (38°C) and 175°F (79°C) at middle adjustable thermostatic setting. On-off switch and power indicator light shall be mounted on top flange of dispenser. Average dish temperature rise of 40°F (22°C) above ambient shall be achieved within one hour of initial heating cycle at middle adjustable thermostatic setting. Mobile tubular frame and dispenser tubes shall be UL listed.